MINNEAPOLIS — From key players healed after injuries to multi-talented newcomers filling out the rotation, Minnesota has a much deeper team than last season. “We’re really confident in his ability to shoot when teams are trying to zone us, and that’s something that we were really missing for a very long time since I’ve been here,” said senior power forward Jordan Murphy, who had 11 points, 17 rebounds and five assists. “I needed to have a guy who was smart out there and was going to be solid,” Pitino said. 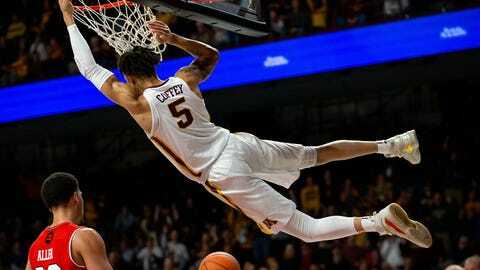 Coffey’s 3-pointer with 5:53 left in the first half gave the Gophers the lead for good at 20-18, and he followed with a steal of Timmy Allen for a fast break and a dunk. Kalscheur sank his fourth 3-pointer of the half for a 33-26 advantage at the intermission. “He’s just got a pro mentality, so every time he shoots nobody’s surprised when it goes in,” Pitino said. Minnesota: This was the only game at Williams Arena for the Gophers in a 28-day stretch, a strange schedule that includes a local game against Oklahoma State on Nov. 30 at U.S. Bank Stadium, the home of the NFL’s Vikings and the site of this season’s NCAA Final Four. With five power-conference opponents on the slate prior to Big Ten play, Pitino’s goal was to not only give the Gophers more early challenges but give the NCAA Tournament selection committee more to consider.